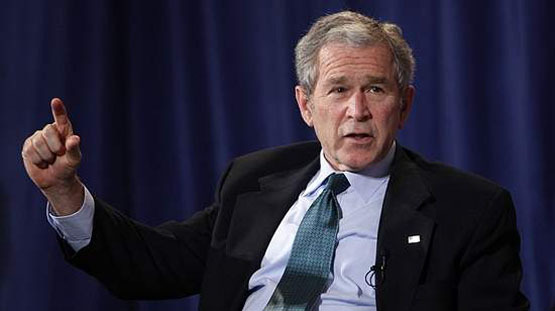 historians rated George Bush as poor, and 61 percent considered him a failure. Bush proponents point to the low ratings that other presidents like Harry Truman had leaving office, that history will reveal that his presidency will be regarded more favorably in the test of time. I don’t concur with this point of view obviously. In some of those polls, Bush rated slightly above a president who died weeks into office. As a matter of fact, if a future president fails more assiduously and profoundly than George W. Bush, our nation may cease to exist, taking the rest of the world with it. Bob Woodward said that no American president is regarded as Commander in Chief of the economy; yet Bush’s decisions as Commander in Chief of the military and as the ideological leader of the dominant party for most of his presidency led in large part to the implosion of our economy. Billions sunk into foreign wars and expanding security demands combined with a record-breaking transfer of wealth from the middle class to the privileged class have gutted the American dream. Endorsement of an anti-regulatory philosophy didn’t slowly infuse down from the top: it exploded, infecting the financial world, gutting our regulatory agencies, ignoring our infrastructure, undercutting the foundations of the American Dream, sometimes literally. When you consider the hatred that hard-core conservatives have for the liberal politics and economic policies of Franklin Roosevelt and The New Deal, and the social programs supported by Lyndon Johnson’s Great Society, it isn’t surprising. It’s basically reflective of an anti-governmental bias so profound that it threatens the social compact between the government and the vast majority of its people. Conservatives warn of the danger of a liberal elite that dominates the media and financial structure. Maybe someone should tell Rupert Murdoch and his peers about that. They don’t seem very worried. What is worrisome is a conservative elite that eschews civic responsibility, fair play, a level playing field, widespread opportunity and the basic elements of a free society. Thanks for the millions in philanthropy; we’d like our country back. What I find so disheartening is that while many of my conservative friends accept that errors were made, they seem still to feel that they were a matter of degree, or that fate queered the course, depriving them of success. The lie of “mission accomplished” in Iraq and the debacle of Katrina were not really Bush’s fault. It was the failure of Iraqis to embrace us as liberators and our foreign way of life, it was the graft and corruption of Democratic politicians that prevented federal intervention. How could our conservative leaders have been expected to foresee and prepare for a less-than-positive outcome, and react to prevent disaster? That would have required… Leadership, accountability and responsibility. The Decider would have to accept responsibility for his decisions. His minions would have to be held accountable. I’m still waiting for the mass firings of those connected with the outing of CIA operative Valerie Plame. I have hope that Joe Biden will be a man of his word, and pursue investigations and indictments of those responsible for misconduct and malfeasance. And if the trail of evidence leads right to the Bush White House, I sincerely pray that our new President will remember that we have to have lessons in order to learn from them. If the lesson is that gross misconduct in public office has no greater consequence than unfavorable opinions of historians, that high officials committing high crimes are above the law, then we know where this country is headed. And we won’t be going there with our heads held high. This great nation will be ushered off the world stage in disgrace and disrepute. That would be a New American Century that every American should find unconscionable. Will the lessons be learned? That, like George Bush’s legacy, remains to be seen. Decisions have consequences. I hope that the consequences for Bush The Decider and his cronies are appropriate to the damage done. Like, accompanied by the sound of a steel-barred door slamming shut behind them in their new residential accommodations, provided again at taxpayer expense, but on a much-less lavish level. May the Higher Power of your choice guide you through the troubled waters of this turbulent first post-Bush year to smooth sailing and a restoration of Amerca’s dreams. This entry was posted on Wednesday, April 8th, 2009 at 7:18 am	and is filed under Uncategorized. You can follow any responses to this entry through the RSS 2.0 feed. You can leave a response, or trackback from your own site.